Pliny the Elder noted that “neither sunshine, shade nor artificial light” would change the appearance of an emerald or an aquamarine. Although the emerald and the aquamarine are very different to look at, Pliny suspected that they belonged to the same gem family of beryl, but it took almost 2,000 years for gemmologists to prove that he was right. Aquamarines vary from a pale, almost colourless, blue green to a deep blue and thus the Latin name “water of the sea” is so appropriate. Earliest references to these fine gems appears in the 1st century BC when the finest aquamarines were brought from India and set into two “shoham” stones, each engraved with the six tribes of Israel, were worn on the shoulder straps of the apron belonging to the High Priest. Today, the most important stones are found in Brazil, and parts of America and Africa. 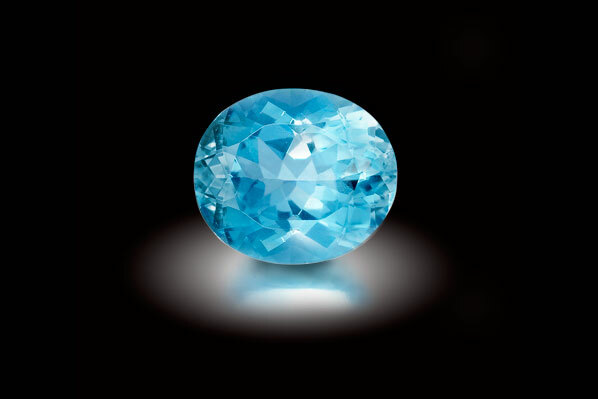 Aquamarine gemstone: Photography by Paul Hartley, Hartley Studios.